April 3rd 2010- I updated this font today, I cleaned it up a lot and fully kerned this typeface including the extended characters a bit more. I also added a .OTF Version as well as the .TTF. This font is freeware for non-commercial use,but if you wish to use it commercially such as on t-shirts,band albums,etc..Read the included Text file,VTC-Vigilante Typeface Corporation Commercial Licensing.txt. Thanks to both of yas! 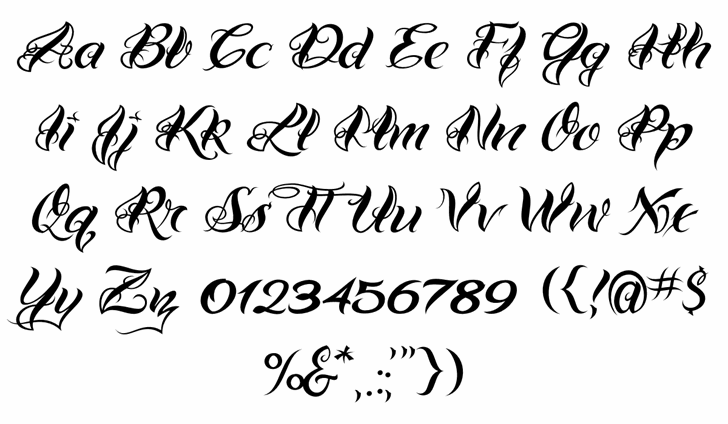 Im stuck between this font, and your other cursive font, for my "To Infinity And Beyond" tattoo that I am getting in a couple weeks. They are both very lovely! Very nice work!